Or view larger version. 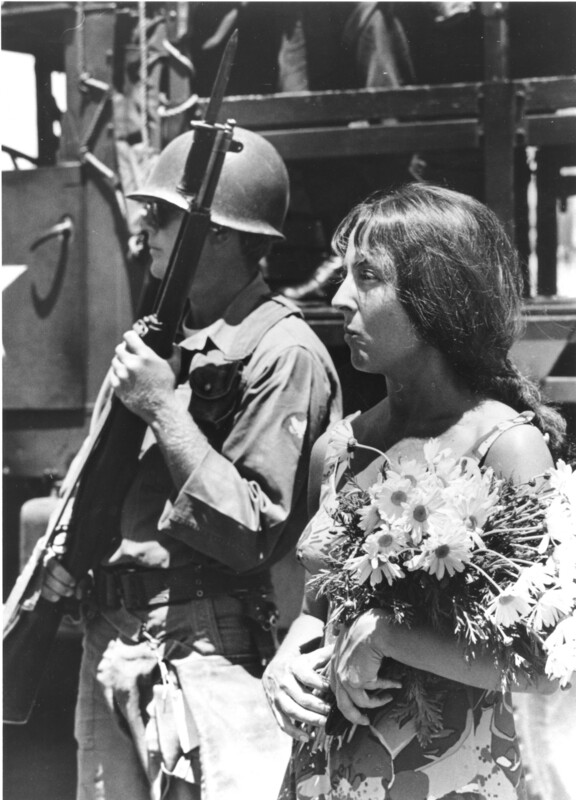 A woman carrying a bouquet of daisies stands next to a National Guardsman. May 30, 1969. Howard Erker, photographer. Gelatin silver print. Collection of the Oakland Museum of California. The Oakland Tribune Collection. Gift of ANG Newspapers. This is a photograph of a National Guardsman and a woman watching more than 30,000 people march peacefully past the People’s Park in Berkeley, California, just two weeks after Bloody Thursday. In support of the march, anti-war groups donated thousands of daisies which demonstrators passed out to guardsmen, many of whom placed them in their rifle barrels and bayonets.